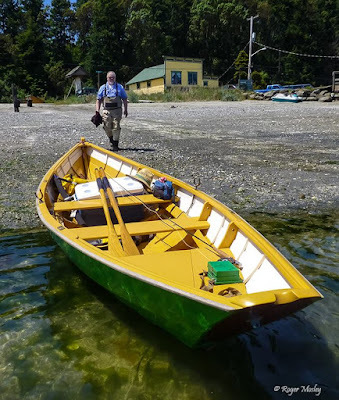 I have been out in the dory all spring, rowing on the bay, scouting the local estuaries, beaches and shorelines, for sea-run coastal cutthroat trout fly fishing opportunities. There's a lot of good water and cutthroat trout habitat here, miles of it. Every month I go looking for new water, mostly on the east end of the Olympic Peninsula and Hood Canal. It seems like there's no end to it. Puget Sound alone has over 1300 miles of shoreline. This is a great way to spend the day. When I am guiding with the dory I only take one angler. That's the best opportunity. It's quiet, stealthy, no motor, no fumes. Sometimes we catch trout directly behind the dory, or within a few easy to cast yards off the sides. I can row you into shallow water, just inches of depth, and we can handle the wind and waves when we need to as well. 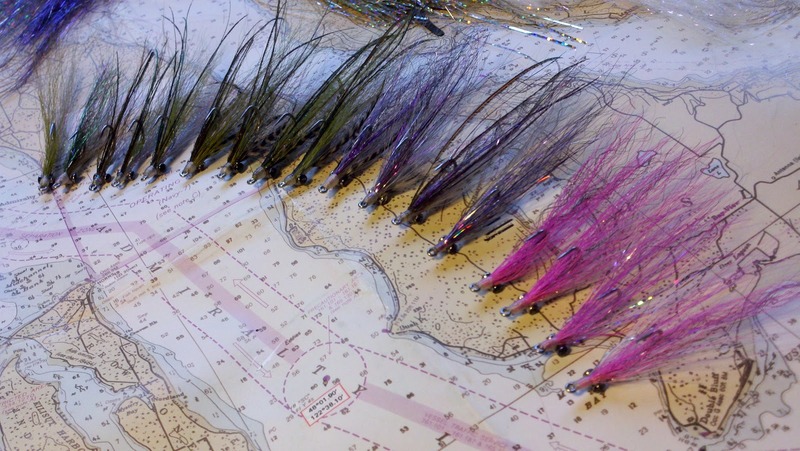 This is the most traditional way of sea-run cutthroat trout fishing in Puget Sound. It's been more like summer than spring here most days lately. This turned out to be the warmest and driest may on record here. And the next 10 day regional forecast is looking very good here too. Our Olympic Peninsula rivers are running below normal in flows right now. this is not unexpected with such a long protracted dry spell. But our annual drought season usually begins in July. So maybe it's early. And maybe June will bring us some more rain to perk things up on the rivers. Sea-Run Cutthroat fishing has been picking up here through the month of May. There's lots of first season in the saltchuck fish showing up, at 2 to 3 years old and 8 to 10 inches. And we've seen plenty of bigger trout this spring here too. They've been taking our Chum Baby fly, Muddlers, Gurglers, Miyawaki Beach Poppers, and various baitfish flies, especially the Clouser Minnow. The bright sunny days we have had actually warmed up the water in our shallower bays. We found the best fishing on the colder water incoming tides, and at depths of 8 to 12 feet at times. Some people will use a sink tip line or full sinking line, to get deep. But I use a longer leader and a floating line, and sometimes a fluorocarbon tippet, with a weighted fly like the Clousers, and I can get the fly very deep. You've got to let it sink! But this is something we ordinarily see happening in later June and into July and August. Don't worry too much about this, because the best sea-runs we have caught were all caught in shallow water under bright sunny skies and hot days. Go figure. It does matter where you fish, and when. Our tidal flows here are coming out of the deeper areas of the Strait of Juan de Fuca and Admiralty Inlet, so we get a lot of cold water coming in on the floods. The farther south you go into Puget Sound and Hood Canal this time of year, the warmer the water and the tougher the fishing can be. As is true of trout fishing anywhere, once the water gets above 60 degrees, it's getting too warm to fish without damaging the trout. That might happen earlier than expected this season. Look for the colder water! Trout season is going to be opening up just about everywhere later this month! I guide fly fishers on the Olympic Peninsula beaches, rivers, lakes and streams. We walk and wade, or row the dory, fly fishing for sea-run Coastal Cutthroat trout in freshwater and saltwater, and we fish in the rivers for trout and summer run steelhead. This is strictly catch and release, traditional fly fishing only. Lunch, snacks, soft beverages, and use of some equipment is included. I also offer personalized and private fly fishing and fly casting instruction. I would be happy to help you plan your Olympic Peninsula fly fishing adventures, for beginners through expert anglers. Public presentations, Naturalist guide, Rowboat picnics, Tide Pool and River trail day trips. Please call, write or email for booking details. Now booking for April through October. Please plan ahead!